facing the fire: What's the difference between the Maunder Minimum and the late twentieth century? What's the difference between the Maunder Minimum and the late twentieth century? Somehow I became distracted by an online "discussion" in which someone was confused about the connections between solar variability and climate variability. The result of that distraction was that I made a plot, shown here, that compares the Maunder Minimum (1645 - 1715 CE) to the last 60ish years (1945-present). Below is the text I wrote to present this figure, along with data sources and citations. Let's compare the Maunder Minimum with the second half of the 20th Century. Since there isn't really that much data, we are limited to a few quantities. I have chosen two, one is the total solar irradiance (TSI), which is the energy received by the Earth from the sun (per time per area, expressed in Watts per square meter). This data comes from a reconstruction by Wang et al. (2005) as modified by Kopp & Lean (2011), and was obtained at the link below. This data is very similar to other reconstructions (Lean et al. 2004, 2000, 1995), but is basically shifted downward by about 5 W/m2 as a recalibration. The updated data covers 1610 to 2011. The second quantity we can investigate is the northern hemisphere temperature anomaly (degrees C). There are not direct observations (of sufficient quality) reaching back to the Maunder Minimum, so we will use the temperature reconstruction of Moberg et al. (2005). That data actually stops at 1979, but we can visually extend the data to near present day by including the observed northern hemisphere temperature anomaly from Smith et al. (2008) which reaches to January 2012. For the Smith et al. data, I chose to use the land plus ocean values. There is an issue with baselines, the Moberg et al. 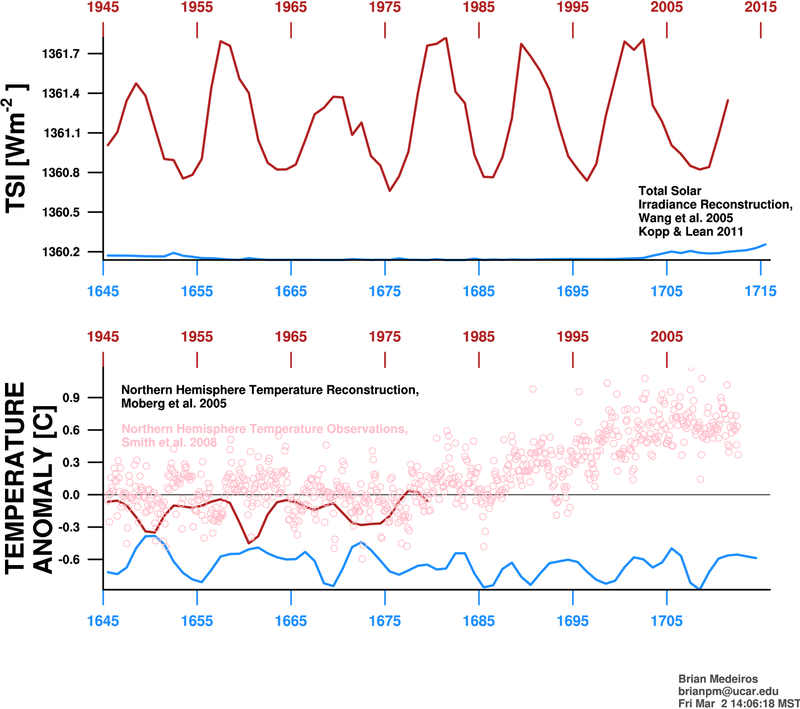 data are anomalies with respect to the 1961-1990 average temperature while the Smith et al. data are with respect to the 1901-2000 average temperature (which is cooler than the shorter, later average). I have not adjusted for this offset, and the result is that the pink dots in the figure should actually all be slightly upward compared to the red line. The agreement between the overlapping interval is quite good, but would be a little worse if the shift were included. There are other reconstructions available, and I have no reason to choose Moberg's over the others except that it is perhaps the most recent. The TSI and temperature reconstruction data are both annual, and I've made sure the data are centered within each year. The Smith et al. data are monthly (which is why I need to center the annual records). Finally, just for completeness, I define the Maunder Minimum using the definition on the Wikipedia page, which is 1645 to 1715. This is in line with the TSI data. For the more recent climate, I chose to simply shift 300 years into the future. So the plots cover 1945 to 2015, but the data sets stop at whatever their last times are. The Maunder Minimum times and data are shown in blue, while the 20th/21st Century data are shown in red and pink with the time labeled along the top of each panel. To try to head off any misinterpretation of this plot, let me simply state what it shows. During the Maunder Minimum, there was reduced solar activity and the average northern hemisphere temperature was about 0.6 C cooler than the the 1961-1990 average value. During the period covering 1945 to the 1960s/1970s, the northern hemisphere temperatures were relatively flat and near their 20th Century average. Over those years, the sun was active, showing "normal" sunspot and TSI 11-year cycles. From some time in the 1970s until present, shown in the pink circles, the northern hemisphere average temperature shows a clear upward trend. All the monthly average values after 1996 are warmer than the 20th Century average. During this rapid and clear warming, the solar activity was typical, and quite similar to the 1945-1975 period, showing clear quasi-periodic activity. There appears to be little connection between variation in solar activity and variation in northern hemisphere average temperature during the late 20th Century. Lean, J.. 2004: Solar Irradiance Reconstruction. IGBP PAGES/World Data Center for Paleoclimatology. Data Contribution Series # 2004-035. NOAA/NGDC Paleoclimatology Program, Boulder CO, USA. Lean, J. 2000: Evolution of the Sun's Spectral Irradiance Since the Maunder Minimum. Geophysical Research Letters, Vol. 27, No. 16, pp. 2425-2428, Aug. 15, 2000. Lean, J., J. Beer, and R. Bradley. 1995: Reconstruction of Solar Irradiance Since 1610: Implications for Climate Change. Geophysical Research Letters, v.22, No. 23, pp 3195-3198, December 1, 1995. Moberg, A., D.M. Sonechkin, K. Holmgren, N.M. Datsenko and W. Karlén. 2005: Highly variable Northern Hemisphere temperatures reconstructed from low-and high-resolution proxy data. Nature, Vol. 433, No. 7026, pp. 613-617, 10 February 2005. It's very useful, thank you for the information.